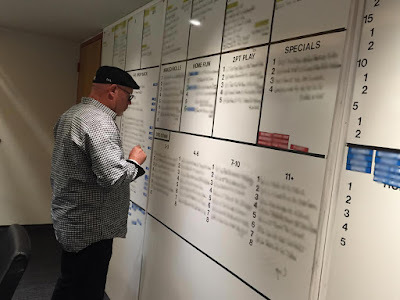 "A Quarterback and His Game Plan, Part I: Five Days to Learn 171 Plays"
"Part II: Virtual Reality Meets Reality"
"The game plan is a collaborative affair, and Arians runs it the way most head coaches have done it for years. In the mid-’80s, Giants coach Bill Parcells used to tell defensive coordinator Bill Belichick at midday Tuesday to throw this out or that out, or that he was making it too complicated, or that he loved what Belichick had, and Belichick would finalize his plan after that talk. Arians does it much the same way—except that after offensive coordinator Harold Goodwin (run game) and assistant head coach Tom Moore (pass game) come to him with their concepts for the week, after some long hours Monday with their staff, Arians formats the offensive practices each day. Then, by the weekend, Arians sees what he likes from his own ideas and from how plays looked in practice. He picks the first 15 run plays. The first 15 passes get done differently in Arizona than in most places. Palmer picks them. After Arians IDs the passes he wants in the overall game plan, Palmer walks up to the whiteboard on Friday and puts a star next to the 15 he wants to run first; they become the first 15 passes. Palmer circles four of the 15, and those four become the passes he wants to call first in the game. Most coaches over time have adhered to the Bill Walsh philosophy of picking the first 15 offensive plays of the game. Arians picks 30, half run and half pass." "Arians picks out six Home Runs per week. 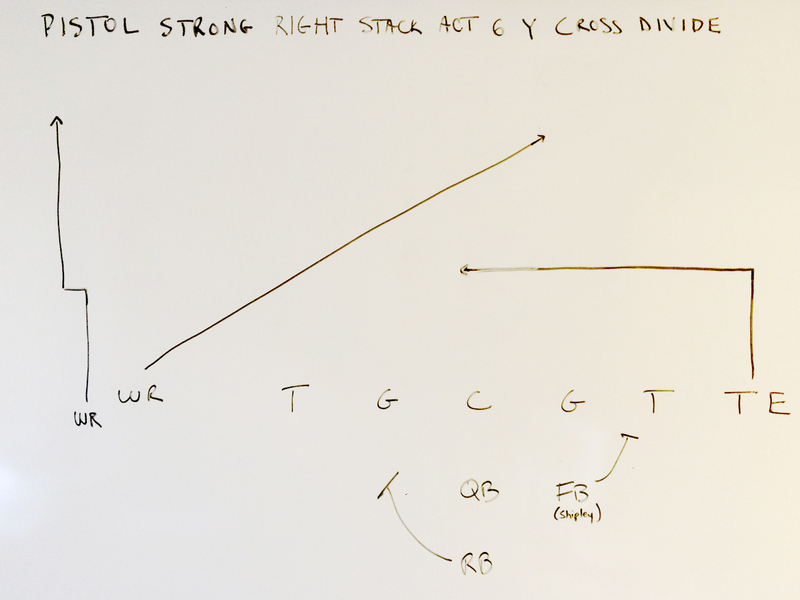 This week, one of the Home Runs stands out above all: Pistol Strong Right Stack Act 6 Y Cross Divide. “I love the play this week,” Arians says. Pistol means Palmer will take the snap four yards behind center. It’s a short shotgun snap. Strong tells the fullback (backup center A.Q. Shipley, in this case) to line up to the tight-end side of the formation. Right is the side the tight end will line up on, assuming the ball is spotted in the middle of the field or the right hash. Stack tells the two wide receivers on the play to line up in a stack to the opposite side of the formation from the tight end. Act 6 is the protection, telling the two backs which linebacker to block if the ’backers rush; the fullback will seal the tight-end side, while the running back will take the blitzer from the middle or weak side, if there is one. Y Cross Divide comprises the two routes run by the wide receivers. 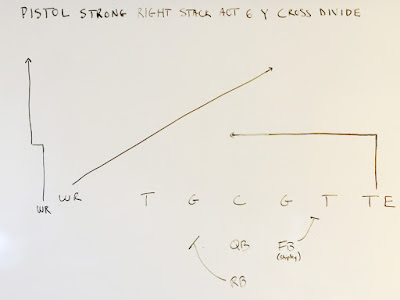 The Y, or slot receiver, will run a deep cross through the formation and hope to take a safety with him, while the split end in the stack will run a divide route; that means the split end, likely Larry Fitzgerald, will run a stutter-and-go, running maybe seven yards downfield, faking toward the sideline, then sprinting downfield. The route is divided into two segments, the first ending in the deke to the right, and then the go."